There's a truism in the entertainment world that for many artists and their creations, their second outing can be cursed -- the dreaded "Sophomore Slump" strikes and the magic is gone. But as Saul Colt, founder and Publisher of SSS Comics, explains, it would seem that the fledgling Canadian company's second year is nothing but charmed. Bill Baker: I noticed that you've recently expanded the SSS Comics line by adding two new titles. What lead to the decision to add these particular books, and why are they a good fit within the imprint? Saul Colt: Let me start by saying thanks! I love to do interviews. SSS Comics has added two new titles to bring our title count to three. The new books are The Mr. Beat Show by Chris Yambar, and The Ultimate Danger Comics Collection: Post Humorous by Bill Jankowski and Mark Gallivan. The decision to add these two books was easy. They make me laugh! I am still new to the comics business and I have no real "knowledge" as to what will sell, so I can only go by what makes me laugh. These books accomplish that and by doing so are a super fit for SSS Comics. BB: Will SSS Comics be adding still more titles to the line up? SC: I am open to adding another title but I think it would have to be something that really knocks my socks off. Three different titles are keeping me super busy but there are so many people I would like to work with like Mike Avon Oeming, Darwyn Cooke, Amanda Conner as well as many writers. So yes there may be another title before the end of the year. BB: Well, does that mean you're open to submissions generally, or is it basically via invitation only? SC: I am not really accepting submissions right now. I had a "submission guide" on my website -- www.ssscomics.com -- for almost a year but have recently taken it down. I received hundreds of letters and samples and there was some really good stuff. Unfortunately, nothing fit into my vision for SSS Comics. I approached Chris, Bill and Mark about their books because I am eager to work with established pros who can bring some attention to SSS Comics while teaching me some stuff as well. I will be appearing at 10 comic book conventions this year and I will probably approach a few people, but I have nothing in the works right now. BB: Are you at all worried about overgrowth, of putting out too much product at once? SC: Overgrowth isn't something I worry about because my plans are to go slow and build on what I have before I get too far down the road. I would like to take this as far as I can and branch out to toys and films, but I know that is something that won't happen overnight. I know I will never be as big as one of "The Big Three" but would love to one day be in the same league as an ONI Press. BB: So who do who you perceive as the audience for SSS books? Is there a certain demographic that you're trying to appeal to with your line, or are you just trying to appeal to as wide and diverse group of readers as possible? SC: My intended audience is anyone who likes to laugh. I am trying to build a small core of books that will have some cross over appeal but also appeal to specific tastes. For those who prefer funny high brow stories Mr. Beat by Chris Yambar is fitting for the intellectual reader. 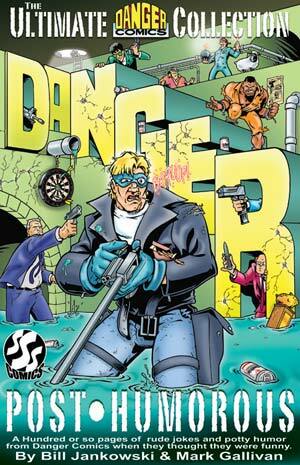 The "Dangerman" books by Bill Jankowski and Mark Gallivan caters to the crowd that enjoys rude jokes and potty humor. Finally Eclipse & Vega, my children, is written for all audiences. The first issue of Eclipse & Vega was widely considered a "T and A" book, and I made a concerted effort to correct that in the next issues. My hope for E & V is to just tell interesting funny stories about the girls and the people around them. BB: Let's jump back in time a bit and talk about how and why triple S was formed in the first place, what you saw as its mission and scope then, and how those two aspects of the company might have changed recently? SC: SSS Comics was formed out of my love of comics and writing. I have always wanted to get into the comics industry and after reading all the "How to break into stories" I came to the conclusion that doing it myself was the best option. When I started I just wanted to put out one story arc, but things have changed and I plan of continuing to publish comics and attend conventions for as long as readers will let me. This is the greatest experience of my life and I am grateful for every minute. BB: And the first year of SSS Comics and the first few issues of Eclipse & Vega was the final result of all that love and work, obviously. For those who might not know about it, how would you describe that particular book? SC: The quick synopsis is that Eclipse & Vega is about two girls who get superpowers and seek the help of a retired Superhero to teach them the ropes. The long version is much more complicated. Since I have many stories stuck in my big brain I plan on throwing E & V into many different wacky situations and really growing the characters into people that you will care about and wonder what will come next. BB: So what's the next challenge for your heroines, and for you? SC: My biggest challenge coming up is dealing with color. Yes, you heard me right -- color. 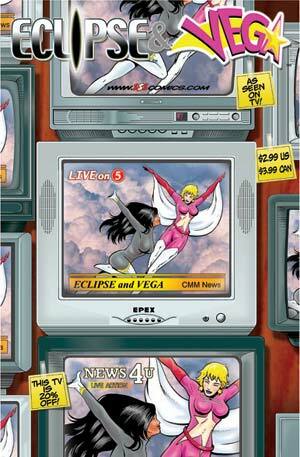 In May I am releasing Eclipse & Vega: As Seen on TV -- it features cameos from 7 main stream and Indy comic book characters! -- and that will be my last black and white Eclipse & Vega book. Debuting at Comic Con International will be Eclipse & Vega: Super Sized Special. Eclipse & Vega: SSS (get it?) will be between 48 and 60 pages -- I'm still finalizing everything -- and a full color spectacular! This book is really going to be cool! It will mark the first time Eclipse & Vega will be written by anyone other them myself. Chris Yambar has written a really funny and great story to open the book. The middle story is my attempt at writing an Astro City-type story and I will apologize right now to Kurt Busiek for lifting his style. Then the book closes with a cool little back up that will expand the continuity of the series. BB: Well, what do you get out of all of this work, whether it is as a publisher or a creator? SC: I get asked this a lot and I still haven't been able to put into words how cool it is to walk in to a comic book shop and see something with my name on it. The only other place I can see my name on the wall is the post office. As a publisher I love to get my books into people's hands and get feedback, good or bad. As a creator I get most of my enjoyment when I finish a story that I am really proud of and I realize that I made something from scratch. BB: What do you hope your audience and your readers get from SSS Comics' books, be they created by you or any of the other fine creators who are publishing with you? SC: I just want people to laugh. To help them forget the day-to-day stuff and to have a good time. None of these three books are trying to cure cancer or even teach you something. They exist only for entertainment and distraction. SC: As I mentioned before, Eclipse & Vega is going full color. E & V will continue to be in color and always be between 48 and 60 pages. I believe in giving my readers more for their money and want to put out the best books possible. I am going to stick with the format of a few stories per issue with one written by a guest writer and one or two by me. Chris Yambar is my first guest writer and after him James Patrick (not the Buffalo Sabre) of Crackurz fame will pen a story. Finally I want to tell/beg everyone to give these books a try -- they will make you laugh! If your shop doesn't carry them ... tell 'em to! And if you haven't checked out my web site you should. It is the single greatest, most super fantastic comic book site on the whole web! So what are you reading this stuff for? Head on over to www.ssscomics.com right now and check out what Saul and company got planned for your reading pleasure in '04. Now go!